Seeking for a destination to spend a nice beach vacation? Go for Maldives - a picturesque island formed by the archipelago of 1,192 gorgeous coral islands. The land mass is located in the Indian Ocean and a part of Southern Asia. The island presents many features which can mesmerize the heart of tourists. For every traveller, it is a dream destination. The combination of white sands on your feet, blue sky above and azure Indian Ocean in front of you make your holiday a marvelous one in lifetime. Its proximity to India makes it an attractive beach destination for Indian holiday-goers. The pleasant climate of Maldives offers an exceptional holiday experience. One can visit the place throughout the year except from June to August as in these months it rains heavily on this island. The place becomes overcrowded with visitors from Mid-December to early January as this is the festive season. Going by air is the most convenient way to reach Maldives. Male International Airport is the main airport of Malidives. When going from India, you have several economical airline options to get to Male. From Male, one can move from one island to another island with the help of motor boats or sea planes. Maldives islands are divided into 2 clusters – North Atoll and South Atoll. South Atoll islands are closer to Male and can be reached by motor boats. North atoll islands are further away and you need a sea plane to get there. Therefore, you may choose the island/resort based on your budget as ride in a sea plane will cost more. There are some resorts that are better suited for honeymooners and some better suited for families. You can find resorts from budget to super luxury category here. Most resorts offer modern facilities and services to make your stay comfortable. One can easily find the information about the resort and their latest deals in internet. After analyzing them, you can reserve your room in favorite resort easily. 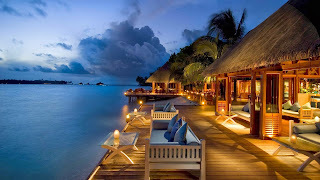 Maldives is a seafood paradise, but it also offers several other international cuisines given the high tourist volume. Indian food is easily available in most resorts. If interested in sampling the local food, there are five famous dishes that one must taste during their visit are Mas huni (prepared from tuna and coconut), Kulhimas (chili tuna), Garudhiya (Soup made from fish), Handulu Bondibai and (sweets made of rice). It makes sense to have all inclusive package as food is generally on the expensive side. If your aim is to just have a relaxing beach vacation, you can just enjoy the beach and clear water and explore the island and facilities of the resort. Apart from that, you can visit Male – the capital of Maldives. There are numerous attractions located in the region and such as Hukuru Miskiiy, the religious place of worship for Islam religion and is the oldest monument in the country and National Museum. You can also check out banana Reef – a protected area where tourists can enjoy incredible activities like diving and snorkeling. One can enjoy beautiful sea ecosystem here. It is a must see place for tourists landing here and they can easily spot snapper, morays, groper, jackfish and barracuda. You can explore the gorgeous caves located here and indulge in water sports activities. Maldives has free visa on arrival for Indians, which is icing on the cake if you are planning to visit Maldives. Hope you have an unforgettable Maldives vacation!